If you dislike the way you look on video, a new kind of image-manipulation software could make you feel better about yourself. 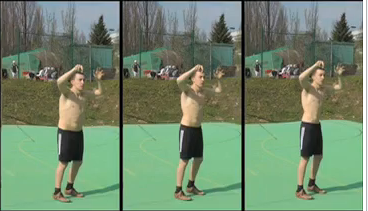 Developed by Christian Theobalt of the Max Planck Institute for Informatics in Saarbrücken, Germany, and colleagues, it allows professional and amateur movie-makers to dramatically alter how muscular, leggy or heavy people appear on film. Until now this could only be done by laborious frame-by-frame retouching. Theobalt's team began by generating 3D scans of 120 men and women of varying size and shape in a range of poses. By merging the scans, they were able to create a single model that could be morphed from any body shape or pose to any other. Turning to the video sequence containing the actor whose shape they wish to manipulate, the team uses a mix of off-the-shelf and bespoke software to track the actor's silhouette through the scene. The software then maps the silhouette onto the morphable model, and tweaks it to generate the required height, weight, leg length or muscularity. The technology has obvious applications in films like Raging Bull, for which Robert de Niro put on 27 kilograms in two months to portray his character. "The actor wouldn't need to go to all that trouble," says Theobalt. It could also be a cost-saver for advertising companies. Because standards of beauty vary across cultures, it is the norm to shoot several adverts for a single product. With the new software, firms could make one film and tweak the model's dimensions to suit different countries. Although the results are realistic, extreme alterations slightly distort a film's background. To found out whether this is distracting, Theobalt's team asked 15 people to view an unaltered video while 15 others watched a version in which the actor's body shape had been tweaked. There was no significant difference between the number of distortions the two groups reported, suggesting that this distortion will not unduly worry audiences. Daniel Cohen-Or of the School of Computer Science at Tel Aviv University, Israel, is developing a similar technique that alters the appearance of people in photographs. He is impressed by Theobalt's software, but notes that it may not always be applicable. "It requires a clear scene, meaning no occlusion or distracting objects," he says.